At about 4 p.m. yesterday I kicked the kids outside. They had eaten their snack and done their chores after school and were starting to climb the walls so it was time for them to, as Gabbie puts it, “get their ya-yas out”. Almost every day they spend an hour outside, more on the weekends, and I believe this unstructured play-time outdoors is critical for their development. I catch a snippet of their conversation as they head out and it usually starts with something like “now pretend you’re the lion and I’m the princess” and I watch them through the window as they head up the stream with willow branch swords in hand. There has been lots of talk lately about the importance of getting children outside, and I am happy to see more outdoor and place-based education popping up in curriculum all over New England. Locally we are incredibly fortunate to have many nature education programs for children – two of note are Four Winds Nature Institute, which trains adult volunteers to share their love of nature with children in the classroom, and Shelburne Farms which is a true champion for outdoor and agricultural education. At Shelburne Farms there’s a program for every age group, from pre-school right up to post-college residencies, and even one day on the farm can inspire a life-long love. I especially admire the Teen Naturalist program – it’s a tough age to engage, but such a critical one. I have written at length in the past about the work of Richard Louv, author of The Nature Principle and Last Child in the Woods, and co-founder of the Children and Nature Network. Yet I still find it sad that we need a “Let’s G.O. 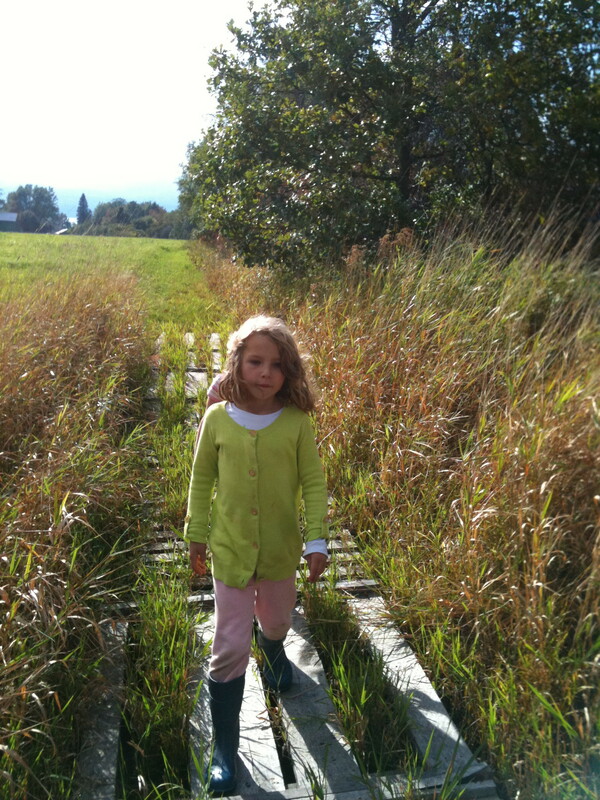 (Get Outside) Month” or Nature Clubs for Families, but obviously we do. Even the American Academy of Pediatrics is taking notice. One statistic that is particularly alarming is this: research shows that 21% of children play outdoors daily, compared to 71% during their parents’ childhoods. That’s a huge shift in just one generation, and it’s not just a problem in urban areas – it happens here in the boondocks too. If it takes a club to help increase parents’ comfort level with the outdoors and helps them carve out time in an ever-increasingly busy schedule to go outside with their kids, then so be it – I can get over the irony of scheduling time to be unstructured. Most of the time kids just need parents to be their reminder alarm – “outdoors is fun, put on your boots and get out there, like right now”. Education doesn’t hurt either. When I was practicing environmental ed in the 90s, the emphasis was on connecting with nature through expeditions, now it’s more focused on finding connection with everyday nature in the place where we are – less on rare plants and animals in far-flung places and more on a personal involvement with our own locality. It’s easier to relate to (and thus feel stewardship for) things we see in our own backyard (a chickadee on a branch) than a creature in a foreign place (sloth in a rainforest). A cornerstone of the Four Winds program is recognizing the need to engage the community: “We believe people long for a healthy connection to the environment and to each other. Four Winds’s community-based education programs bring children and adults together to explore the natural world. Through these programs, we are helping people of all ages make meaningful connections to nature. It is these connections that will nurture and fuel us all as we work together to address the increasingly complex environmental issues ahead of us.” Parents have a pivotal role to play in this process. 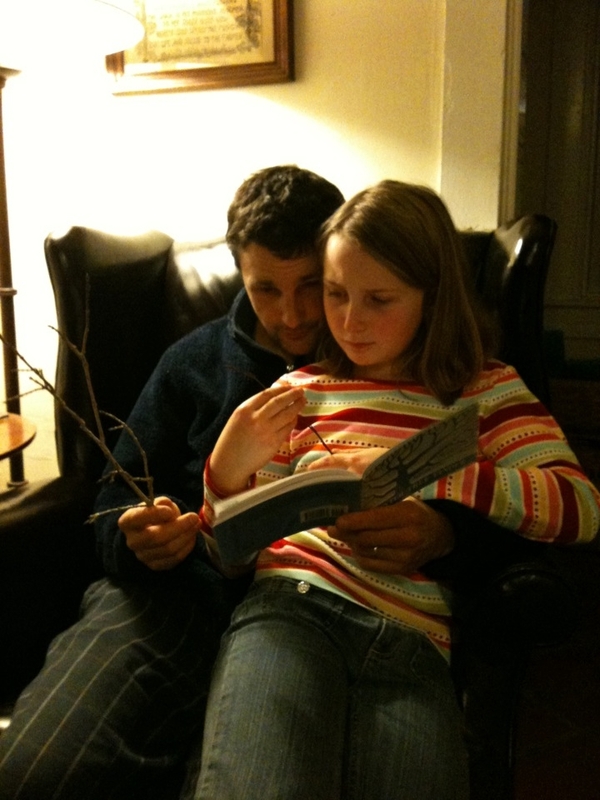 I still remember very clearly the day my Dad took time out of felling trees for firewood to teach my sister and I how to estimate a tree’s height with our thumb, and how to identify different species by the bark. Tim recently did the same for Elsa and Gabbie. While it is undoubtedly most important that children cultivate a wonder for the natural world, learning the names for the things surrounding them helps them to communicate their discoveries. We have had lots of fun getting to know birds by ear with The Backyard Birdsong Guide by the Cornell Lab of Ornithology, and identifying plants and animal tracks with various field guides. If you want more in-depth wildlife monitoring training, you can attend the amazing programs held by Susan Morse and her organization Keeping Track based in Huntington, VT, whose objective is to “inspire community participation in wildlife habitat stewardship”. While such professional level education is wonderful, I think the most important thing is to encourage kids to simply step outside and start observing. 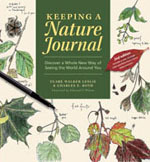 For Elsa’s 9th birthday I gave her the book Keeping a Nature Journal by Clare Leslie and Charles Roth, along with a blank journal and a set of watercolor pencils. Clare says “nature journaling compels us to slow down, observe, reflect, and once again embrace our connection to the living mosaic that is our environment.” The book is geared primarily towards adults, but with some guidance Elsa has already begun drawing some wonderful observations of plants and as the weather warms I look forward to spending time with her out on our trail, journal in hand. 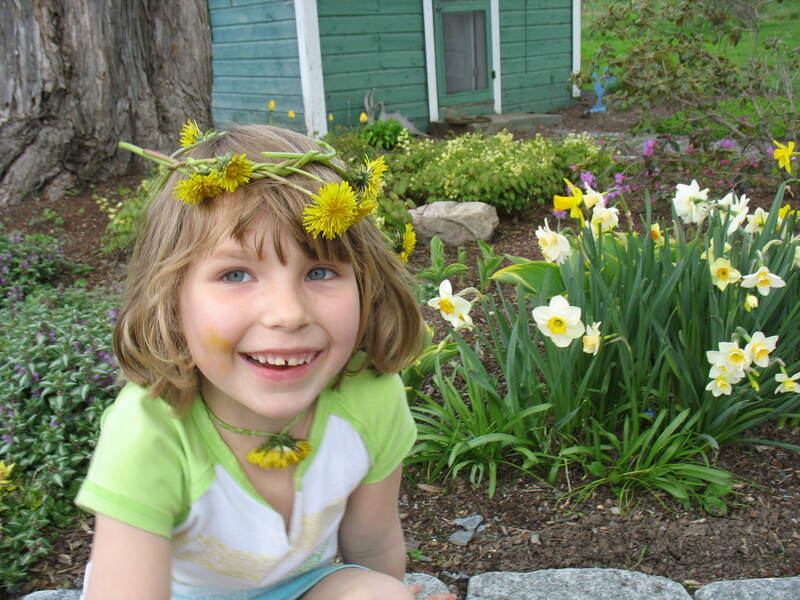 My greatest accomplishment in life would be to raise naturalists – that encouraging my children to go outside and play in treehouse castles decked in dandelion crowns will help them remember as adults the joy they experienced, and that the natural world is something worth saving. This entry was posted in Life and Family, Uncategorized and tagged children, Cornell Lab of Ornithology, Last Child in the Woods, Nature, Nature Journaling, place based education, Richard Louv by Rebecca Lindenmeyr. Bookmark the permalink. 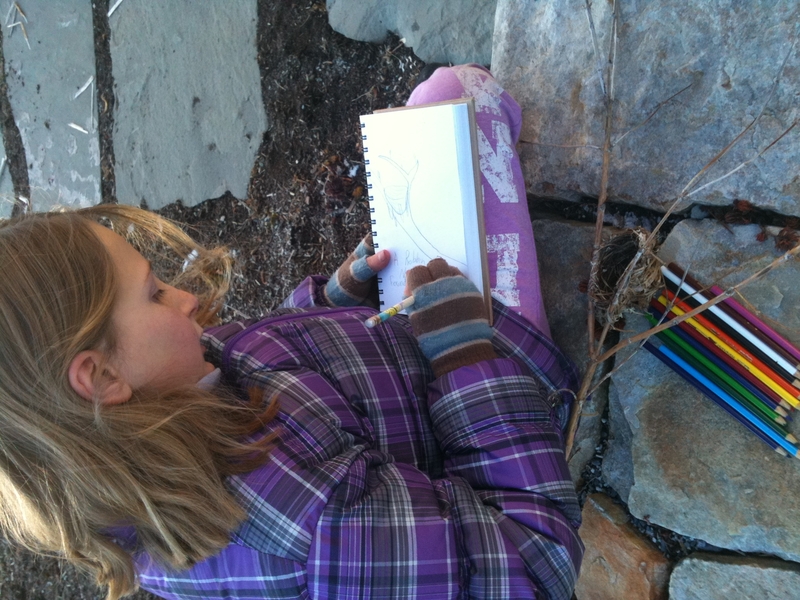 I have raised a naturalist who is now studying landscape architecture. What can be more fun than exploring nature as a mother-daughter duo! She is 30 and I am 60! Can’t wait to return to Vermont in April where we live in Chester during the summer. At the moment I am in Lima, Peru where it is noisy and there is little nature, even here in Miraflores (see the flowers in Spanish!). Keep up the good work! Thanks so much for reading the post and have a save trip back from Lima, sounds exciting!